PETA: Whatever you do, don't ask him about his hair. RONNIE: Why? What's wrong with his hair? PETA: Nothing. Just don't ask him, you know, like, who cuts it, what products he uses, if he has a name for the style. RONNIE: A name? He has a name for his hair? PETA: Just don't ask! Okay? Don't even think about it. RONNIE: Okay, but, you know, now that it’s on my mind, that's all I'm gonna be thinking about. RONNIE: (Softly mumbling) Sorry, Peta. RONNIE: Nothing. Dries, what was the first computer you owned? DRIES: The first one I actually used was a Commodore 64, when I was about six years old. It was my dad's, so I can't say that I owned it, but I was able to use it. 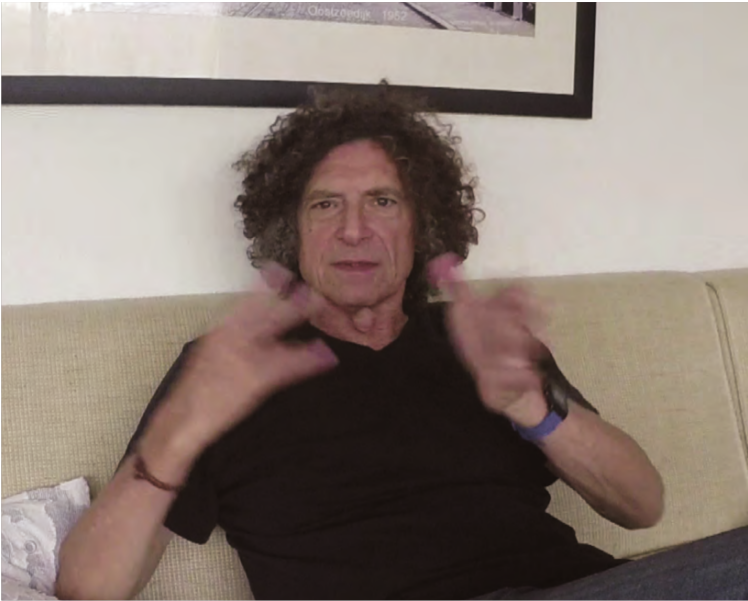 RONNIE: And you created Drupal on that computer? DRIES: No. I could barely read or write. DRIES: When I was six or seven, my parents bought me a computer book for kids, and I spent hours copying BASIC code from the book into the computer. And when I was done, I would run the program, and – assuming I typed it in correctly – there would be a little game I could play. RONNIE: Before you could read or write. DRIES: Yes. My dad was a doctor – a medical doctor. He asked me to automate his patient management system using a computer program instead of on paper. One night he came home from work and gave me Clipper, a database and programming language not unlike dBASE. He also gave me a compiler book and all these reference books in English, which I would read along with an English-to-Dutch dictionary. It was very hard. I remember spending my entire summer vacation helping him build this program. So increasingly, I got into computers. When I finished High School, I enrolled in a computer science program at the local university. RONNIE: Cool. Now the important stuff: Music? DRIES: I listen to everything, and I like a variety. Part of me is still stuck in late-’90s music, like Pearl Jam. DRIES: I read a lot, primarily business books. RONNIE: What’s on your nightstand now? DRIES: A book on stoicism, which tells the history of stoicism and tries to apply it to modern life. DRIES: Also, a new book by Peter Thiel – an early investor in FaceBook and a co-founder of PayPal. It’s called Zero to One and it’s about start-ups. DRIES: Ever since I moved to the U.S. I’ve gotten into American football. Just watching it on Sunday afternoons is a nice lazy activity, especially after a very busy week. I usually record the game and then fly through it in an hour or two. RONNIE: What are you obsessing on these days? DRIES: Well, my PhD research was about scaling software in Java, virtual machines, and Java applications. A lot of the work I do now in Drupal also involves scalability: How do we scale the Drupal Association? How do we grow that organization? How do we scale Acquia? DRIES: Yes, I feel like it’s a theme. I’m interested in both the technology side, and also the business and people side. It excites me to think about what we could be, and I’m trying to figure out: If this is what we want to be, how do we actually get there? RONNIE: I hear you led a bot. HOLLY: A BoF. Yes! We had a BoF for people who like to knit and are at DrupalCon and it was really great because we all worked on our projects and talked about how we learned to knit. RONNIE: (disappointed) Oh. A... uh knitting BoF. Nice. HOLLY: I love that there are so many knitters in Drupal. I mean, the relationship between knitting and coding, pattern discernment, and building – all the things we love about Drupal it’s all there in knitting, too. RONNIE: Definitely. Uh, so how are you enjoying DrupalCon? HOLLY: This one is really interesting to me because – well first of all, we have 2,300 people here – 500 more than at Prague. That’s a lot. RONNIE: Nice. Tell me, what are you reading these days? HOLLY: I’m reading a book called The Last Ship. I don’t recommend it – I hate it – it’s taking me months to get through. I’m also concurrently reading a couple of Cory Doctorow books, Little Brother, which is a young adult novel, really really good and – oh, what’s it called when all the people go to heaven except the bad people? HOLLY: The rapture, yes, that’s it! The Rapture of the Nerds. MORTEN: I am Morten, also known as Morten DK. RONNIE: You gave a talk? MORTEN: Yes, I gave a talk about the Drupal 8 Twig project, which is the new theming layer. 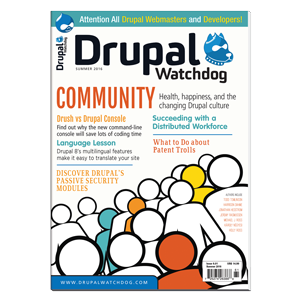 [Editor’s note: see Morten’s article about theming in Drupal 8 on page ### of this issue.] And I gave a demo – it was a real gas to show off everything we have done over the last year and how the new system is going to work in Drupal 8, from a front-ender’s perspective. People could see we’re not just lying, but it’s actually real. RONNIE: Cool. What are you reading now? MORTEN: Ah – oh – uh – (bleep) – what’s the name of it? I have it on an audio file, it’s a fantasy story with a lot of blood and personal vendettas. Good clean fun. But I haven’t had much time to read for a long time because I’ve been working so hard on the Drupal project. Also, I took up my old hobby of painting miniatures again, just to geek out. RONNIE: Who are you listening to? MORTEN: I’m a metal-head so I’m into a lot of Opeth, a Swedish metal band – it’s a grown man’s metal – and another Swedish band called Arch Enemy. RONNIE: What’s the most exciting thing about Drupal 8 for you? MORTEN: Definitely the front-end, the Twig system and the templates, and the way we have shifted focus in the front-end completely around, from being an afterthought to a whole new system that has been built for front-enders instead of built by back-enders for front-enders. We’ve taken control over our own destiny, and I think that’s going to be the killer app for Drupal 8. RONNIE: Oh, wait. I’ve had you upside down. RONNIE: Uh, let’s try it again. ANGIE: I go by Angie Byron or webchick, and more people know me as webchick than Angie Byron. ANGIE: What I love to do at DrupalCon, on the last day of the sprint days, is walk around to all the tables and see what everyone is working on. RONNIE: And what are they working on? ANGIE: Well, there’s hundreds of people here and they’re all scratching their own itches on everything from Drupal-dot-org to what is the newest coolest content staging thing going to be, to how are we going to get Drupal 8 done? And everybody is working together and collaborating with people they don’t get to see all the time, so it’s a lot of fun for me. ANGIE: Yes. I feel like we made a lot of really great decisions about the Drupal 8 release management stuff that we’ll be able to put into practice, and help focus efforts on getting the critical issues resolved, clean up the loose ends we still have, and get the release out the door faster. RONNIE: Time is without mercy. ANGIE: The other thing I’m going to work on for the next month is the Drupal Module Upgrader, which is the script that can help contrib modules port their modules to Drupal 8. It automates a lot of that task. Now that Beta is here it’s a great time for people to update their modules, so I want to work on tools to help facilitate that. RONNIE: Tell us what you’re reading. ANGIE: Kids books. I have a daughter who’s 16 months now and she loves to be read to. So my latest books are Where is the Green Sheep?, Go, Dog, Go! and a bunch of Richard Scarry stuff because she loves to know what everything’s called. RONNIE: Richard Scarry, Cars and Trucks and Things that Go, one of my favorites. ANGIE: And there’s a Dr. Seuss book called Oh, The Places You’ll Go! That book is dark, man, that is a dark book. I remember it from when I was a kid but I don’t remember it like that! ANGIE: I listen to a lot of old music cause I’m one of those curmudgeonly people who thinks the best music was already made. So, ‘70s rock, ‘80s pop, ‘90s punk rock, that’s what’s in my chain all the time. Hair metal, junk like that. How to re-live my kid-age stuff. RONNIE: Uh... Any parting thoughts? ANGIE: I think the community has grown to such an enormous size now that one thing I wonder is if we can still maintain that small-knit community feel that we had. Back when I started, there were 70 people – not the 2,500 people we have now. It’s cool to walk around DrupalCon, especially on a sprint day, cause I feel we have retained that – and people are finding people to connect with and cool things to work on. I think it’s something we all need to collectively be intentional about. 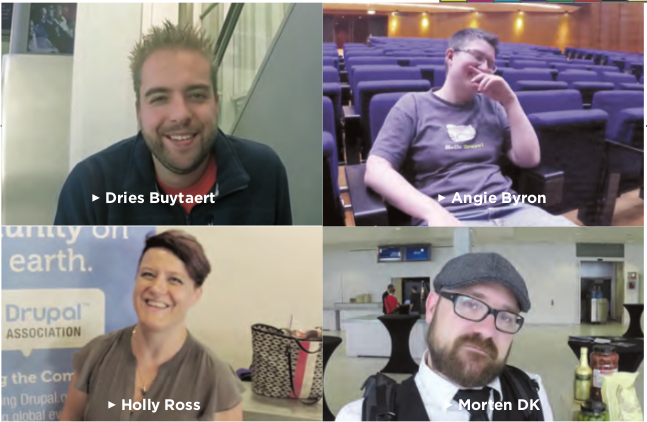 Drupal is not just a great software project, it’s also about the people and trying to maintain that welcome feeling that got us all in the door. So that’s something I would leave as a parting note. Dries Buytaert; Morten DK; Leslie Hawthorn, Director, Developer Relations, Elasticsearch; Tom Erickson, CEO, Acquia; Michael Meyers, V.P. Large Scale Drupal, Acquia; Holly Ross; Bastian Widmer, Development and Operations Engineer, Amazee Labs; Robert Vandenburg, President and CEO, Lingotek; Fabian Franz, Senior Performance Engineer, Technical Lead, Tag1 Consulting; Kieran Lal, Technical Director, Corporate Development, Acquia. When is Drupal 9 coming out? MICHAEL: I think that the real question is how fast can we accelerate the pace of innovation in the Drupal community and get to 8.1, 8.2, 8.3, and I’m a lot less interested in Drupal 9 right now. HOLLY: (laughing) How much time have you got? BASTIAN: Let’s first finish Drupal 8. ROBERT: When is Drupal 9 coming out? Never! When pigs fly! FABIAN: (thoughtfully) I’m still thinking about Drupal 7. KIERAN: I actually know the exact time.... When it’s ready. There are lots of new features for testing Drupal sites, making the process simpler and more efficient. Herein, some examples and explanations. Ron Brawer, a native New Yorker, is Drupal Watchdog editor, and also a columnist at the magazine ("Baby Steps"). Los Angeles is his third DrupalCon. He enjoys the community, the camaraderie, and the free beer.